In 1993 I photographed Southern Pacific 7482 parked in Truckee, California leading a grain train that had been split to clear a nearby intersection. There were five units on the front of the train, and it’s been a goal of mine to model all of them. 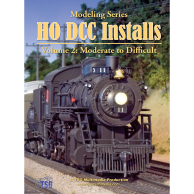 So far I’ve finished just two, this model and Conrail SD40 6283, featured on HO DCC Installs Volume 1. I started this model back when the only way to get an SD45 with a scale-width hood was to either buy brass or use a Rail Power Products shell. I opted for the latter since it was a much cheaper option. I bought a Proto Power West drive, which is basically a re-motored Athearn SD45 drive with the frame milled down to fit inside a narrower hood. The mechanism is nice and heavy and runs very well. With headlights on both ends, ditch lights, and a beacon, this model would require control of 5 lighting functions. Since the ESU LokSound 3.5 only has 4 function outputs, I decided to do a two-decoder install, using a TCS Fleet Lighter to run the ditch lights. On the DVD I show how I installed both decoders. Only common CVs or those that were changed from their default values are listed. Some settings reflect my personal preferences for speed matching and performance. The LokSound 3.5 has an outstanding BEMF implementation, and I left most of the BEMF-related CVs at their defaults. 3 (acceleration) 32 This controls how quickly the locomotive changes speed when accelerating. 4 (deceleration) 24 This controls how quickly the locomotive changes speed when decelerating. 5 (top speed) 23 This controls the maximum voltage applied to the motor at full throttle. 6 (mid speed) 12 This controls the voltage applied to the motor at half throttle. 17 (extended address) 221 For locomotives with a 4-digit address, CV 17 and 18 together determine the address. To be honest I never try to set these manually. My Digitrax system does all this automatically for me when I program a 4-digit address. 53 (control reference) 56 Reducing this value from the default has the effect of lowering the starting speed of the locomotive (though it is still good with the default value). LokSound decoders are great at low speed crawling, making for amazingly smooth starts and stops. 115 (beacon) 62 The LokSound lighting outputs can be configured in a variety of ways. This value produces a pretty convincing flashing effect for the rooftop beacon. 122 (volume) 24 This is the bell sound volume. 123 (volume) 34 This is the auxiliary sound volume (prime mover, brake squeal, and everything else). 165 (F4 button forward) 4 This makes the F4 key on the DCC controller activate the F1 output on the decoder when the locomotive is set to move in the forward direction, the one I used for the beacon. 4 is the default value but I wanted to mention it since this is really a function key remap. If you keep the default setup, F4 doesn’t activate any sounds, so it’s a good key to use to turn on extra lights. 168 (F4 button reverse) 4 This is the same as CV165, only it governs when the locomotive is set to move in reverse. I haven’t tried it, and don’t know why you would want to, but it should be possible with a LokSound to have a function key do different things in forward and reverse. Only common CVs or those that were changed from their default values are listed. Some settings reflect my personal preferences. 16 (decoder lock) 3 When this CV is set to something other than 0, the decoder is locked and won’t program except for CV15. CV15 has to be set to the same value to unlock the decoder. This is useful when two or more decoders are installed in the same locomotive, allowing them to be programmed independently. This is especially important when mixing brands, as not all CVs are standardized, and the same CV might do two completely different things in two different decoders. You don’t want to mess up the programming in one decoder while programming the other. Decoder lock prevents that. Each decoder should have a different value for CV16. 35 (green wire mapping) 1 Maps the green wire to turn on when the F0 (headlight) key is on. This keeps the ditch lights on steady when the locomotive is set to move forward. 36 (purple wire mapping) 1 Maps the purple wire to turn on when the F0 (headlight) key is on. This keeps the ditch lights on steady when the locomotive is set to move forward. 51 (green wire – F1) 10 Sets up the F1 (green) output on the decoder as a ditch light. 52 (purple wire – F2) 11 Sets up the F2 (purple) output on the decoder as a ditch light. The CV value is different to keep the ditch lights out of phase (alternating) when flashing. If the same value was used in both lights they would blink on and off together. 117 (ditch light blink rate) 1 This controls the rate at which the ditch lights flash alternately. Though this locomotive is an excellent runner, as smooth and quiet as a Kato, I don’t see myself repeating the exercise. If I wanted to do another SD45R (actually I do, because 7479 was also in the consist back in 1993), I would start with a Kato, Proto 2000, or one of the newer Athearn “Ready-to-Roll” models. The Proto Power West mechanism I used is very good, but I did swap out the stock sintered iron wheels for nickel-silver wheels from NWSL for better electrical contact. I only kept the long hood and sill from the Rail Power shell. The nose and cab are Cannon parts. The handrails are custom made, and I also applied numerous other details. The sound quality of the LokSound 3.5 is largely dependent on the sound set that’s programmed into the decoder’s memory. The EMD sounds are generally very good, especially at idle. The 20-cylinder EMD for the SD45 sounds especially good to me, and I like the Nathan 3-chime horn. The TCS Fleet Lighter is available in both 2 and 4-function versions. I didn’t really need 4 functions for this model, but when I was shopping for decoders the price was almost the same so I opted for the FL4. I really like the lighting effects available in these TCS decoders. They can be set up to do all kinds of effects, like mars lights, beacons, flashers, Rule 17, etc. I like them because once they’re programmed, I can pretty much lock them and forget about them. 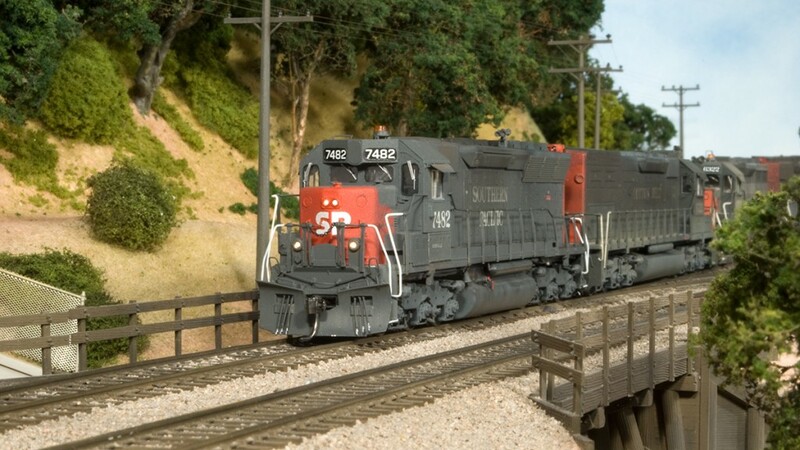 Operation is seamless once the locomotive is back together and completely programmed, and you don’t need to do anything special because there are two decoders instead of one. Just drive it like you would any other locomotive. These function-only decoders would work well in passenger cars and cabooses, too!